Mobile security is often overlooked and not given the same attention as your personal computer or laptop. However, smartphones and tablets require just as much, if not more, attention as your computer. These devices may contain just as much personal information as your home computer. In addition, they have a much greater chance of being lost or stolen. Below are some tips you can take to better secure your mobile devices and minimize the effects of a lost or stolen device. Lock Your Device - leaving your device without a password, PIN, or pattern lock is like leaving your front door open. 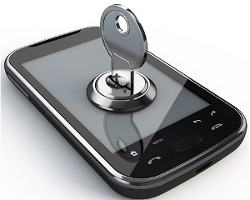 Anybody that gains physical access to your device has full control of everything on it. Also remember to enable the auto-lock or time-out feature so your device automatically locks after a pre-defined period of inactivity. Keep Your Software Updated - your phone and app vendors will periodically issues updates to their software. Always install these as they may fix known vulnerabilities or add new features. Be Cautious With Public Wi-Fi - other users of the same hotspot may be able to eavesdrop on your online activities. Enable Remote Tracking - if your device is lost or stolen this will enable you to either lock or remotely wipe your device. Also be sure to notify your wireless provider about your lost device.